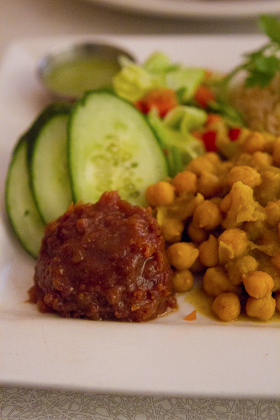 I’d never been to a full-on vegan restaurant until we visited Montreal earlier this month. There’s such a healthy, take-care-of-your-body, organic pulse to the city, it’s fabulous. 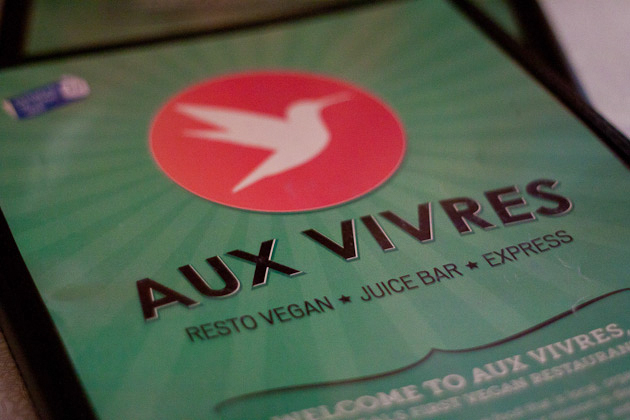 Just as I had with Crudessence, I went to Aux Vivres twice. Partly because I was in the mood for another vegan meal, and also because I couldn’t leave without trying their vegan chili fries. A good reason to return, no? 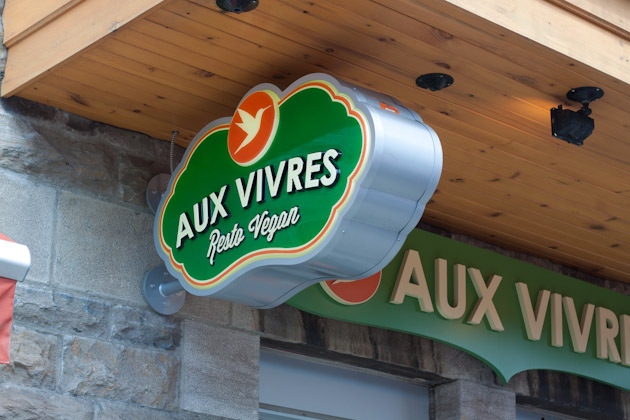 Aux Vivres is a restaurant and a la carte express shop on boulevard Saint-Laurent, just a couple minutes walk from the Mount-Royal metro station. 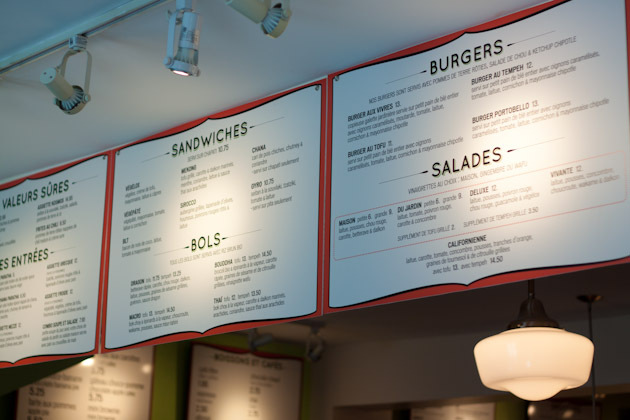 They have a sit-down restaurant area filled with small tables stuffed in the corners all over the place to maximize on space, a to-go counter, as well as a delivery service that you can order from online. 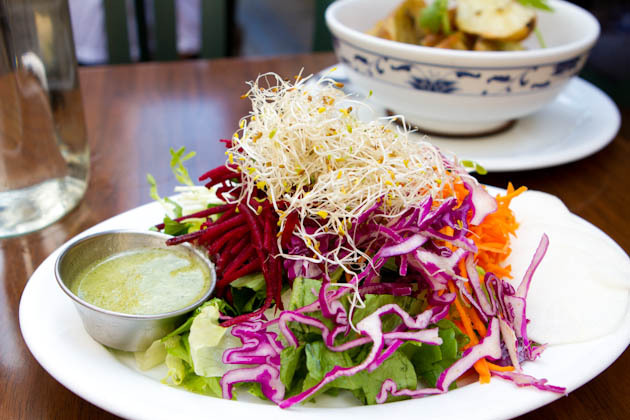 In 1999, the restaurant hit the dining scene in Montreal as a hole in the wall vegan spot ran by Marie-Pierre Michaud; a lady with a passion for organic foods, vegan meals, and balanced nutrition. 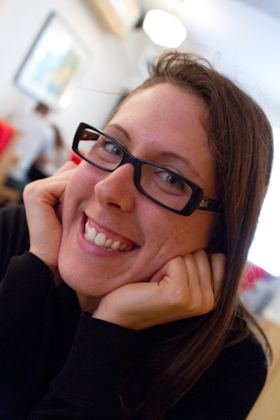 Shortly after, she hired on Michael Makhan who later became partner and then owner of the up and coming restaurant. To help with design and expansion, Michael enlisted the help of his brother, Liam. Now, four years later, Liam and Michael are true partners, running the successful vegan business on one of the trendiest streets in Montreal. It’s evident that the two brothers take their business very seriously and are passionate about what they do. 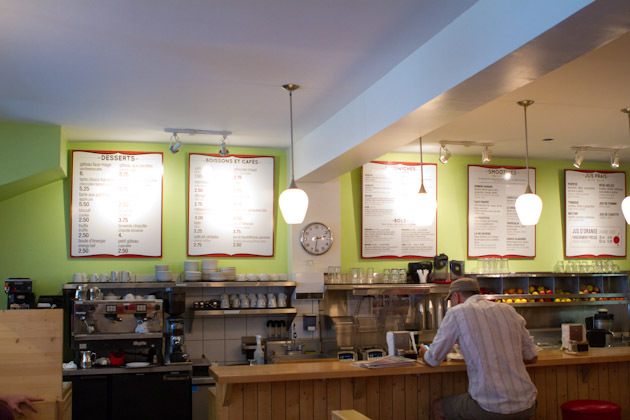 Aux Vivres has everything a diner could hope for from a well planned and executed menu, warm and inviting space, community feel, and friendly staff. 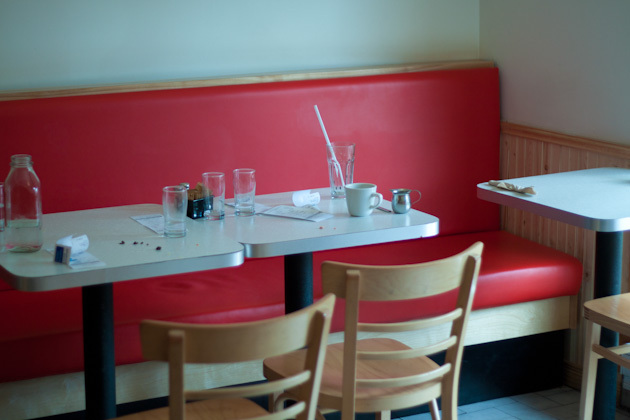 It’s easy to dine here. Kevin and I arrived at around 1pm on Monday afternoon. The restaurant was crowded, but we didn’t have to wait for a table. We were seated on the opposite side of the pony wall to the kitchen, a very similar setup one would see at The Naam in Vancouver. What I loved about the menu (which came in English and French) was that they had symbols for nut, soy and gluten allergens. It made selecting an item so easy! I didn’t have to ask the waiter for substitutions, wait to figure out what I wanted, or settle for something I wasn’t too keen on. Also, there was a little bit for everyone! I seem to be all about the comfort foods lately so it was no surprise that I was instantly drawn to the comfort foods section of the menu. It’s worthy to note that the temperature was 28C that day and I’d been sweating buckets on the metro just minutes before, yet all I wanted was a big bowl of something warm and filling. With organic brown rice, chickpea & potato curry, salad & chutney, the Mumbai Plate had everything I was looking for, for lunch that day. Kevin was in a burger kinda mood (as he always is) so he ordered the Tofu Burger which was said to be served on a whole-wheat bun with caramelized onions, tomato, lettuce, pickle & chipotle mayo. We ordered our meal about 5 minutes after we’d been seated, and waited patiently (about 20 minutes) for our plates to arrive. The Mumbai plate was just the thing I needed. The curry wasn’t too overloaded with spices, had great, fresh flavor (which is often challenging to find in a curry), and the chutney that accompanied the meal was a thing of dreams. I later asked if they offered the chutney through their take-out service and they do not. Boy, they could bottle this stuff up and sell it, it’s that good. The meal came alongside a fresh veggie salad; which I mixed around in the chutney, and a balanced portion of brown basmati rice. All in all, it was fabulous! And, to my surprise, I was able to polish off the whole meal. One thing I noticed in Montreal is that their portion sizes are a bit smaller than at home here in Alberta. 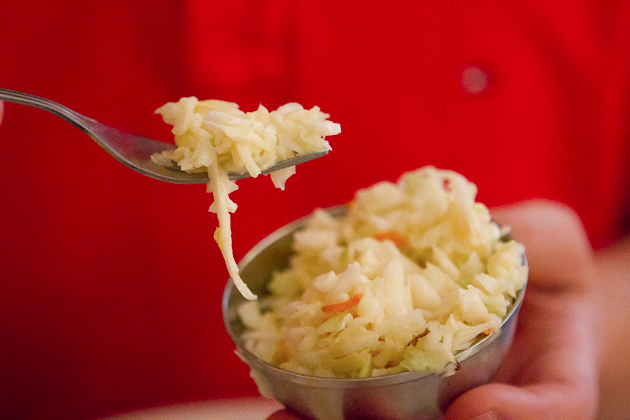 You can finish a plate of food served to you at a restaurant and not feel heavy, bloated, or uncomfortable afterward. Kevin’s meal on the other hand, wasn’t as satisfying. Unless of course you like snacking on a plain wedge of tofu, then this burger was likely created for you. Kevin found his burger to be flavorless, despite the onions, mayo, and fillings. 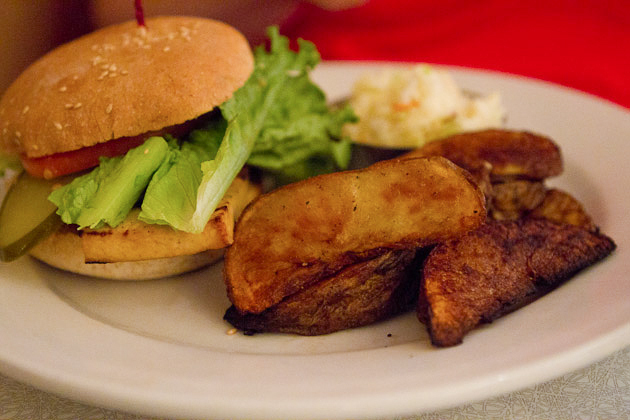 When we’d read burger on the menu, we’d assumed it would have been a patty, not a slab of tofu in a bun. It was mildly disappointing especially because later, when Kevin told the waiter it wasn’t a good meal, the waiter responded with, ‘Ya, it’s not my favorite either. Kind of tasteless, right?’…. If your staff don’t enjoy something on the menu, chances are your patrons aren’t going to, or should at least be told that the tofu burger is not a ‘burger’ by any meals. Meh, the fries and coleslaw were delicious! 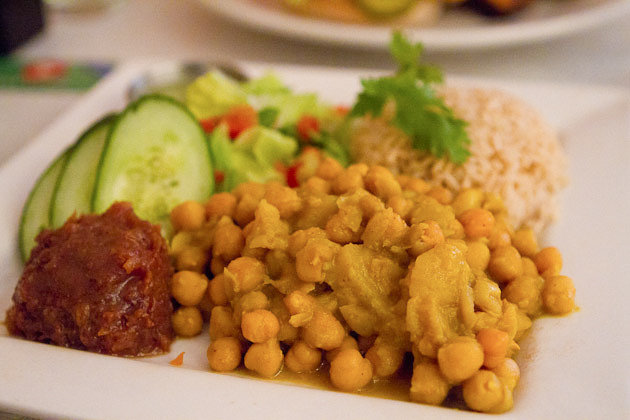 As bad as I felt for Kevin’s meal being sub-par, the day I ventured out on my own to Jean-Talon Market, I decided to stop in at Aux Vivres again for another tasty vegan meal out on their patio this time. I’d only had a Jugo Juice smoothie 5 hours prior to my visit, so I was ready to indulge in some chili fry goodness – another comfort food classic on their menu. I decided to order a small side salad to balance things off. 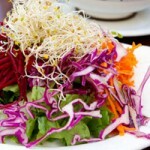 The side salad itself was gorgeous – crisp green romaine covered in purple cabbage, shredded carrots, and beets, with a generous helping of sprouts, it was just what I needed to accompany the bowl of deep fried fries that was to come. And come it did! I chose to opt-out of the sour cream they generally serve with the chili fries as it’s made from soy. The chili itself had tofu in it, but I figured the more soy I could try to avoid, the better. 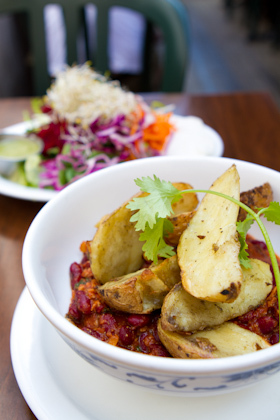 The chili fries came with 5 potato wedges and about 1.5 cups of veggie chili. Again, the serving size wasn’t too large, the dish was perfectly spiced – not too spicy, not too bland, just right. I ended up having a conversation with one of the men sitting adjacent to my table who happened to have visited the same Sivananada ashram I had in India just a couple of weeks after me. Small world, right? 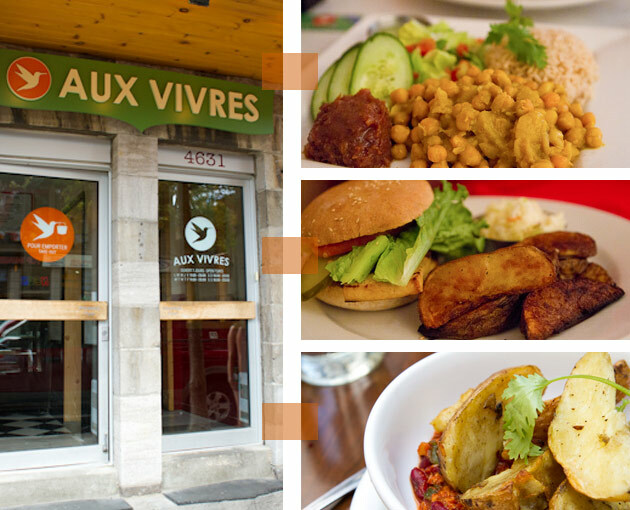 All in all, Aux Vivres is a fabulous restaurant, filled with great gluten-free, vegan meals, eclectic menu items, and an interesting dining atmosphere. I would definitely go again!